Altitude range: 2400-2800(3250?) metres above sea level. Habitat and ecology: Yellow spined specimens (S. flavissima) occurs along with dark spined individuals (S. mentosa) in the whole area around Aiquile. Nowhere homogeneous stands of Sulcorebutia flavissima had been found, but yellow and dark plants grow intermingled close one to each other, and are part of the same polymorphic population. 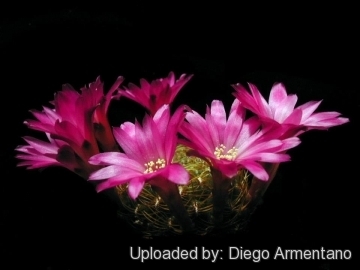 Description: Sulcorebutia flavissima is generally included within (as a synonym of) Rebutia mentosa, suggesting that there is not really a fundamental difference between the two. The name "flavissima", meaning "most yellow", refers to the yellow colour of spines. The overall yellow appearance helps distinguish this plant from other morphological forms of Rebutia mentosa. It is a clear form of Rebutia mentosa. 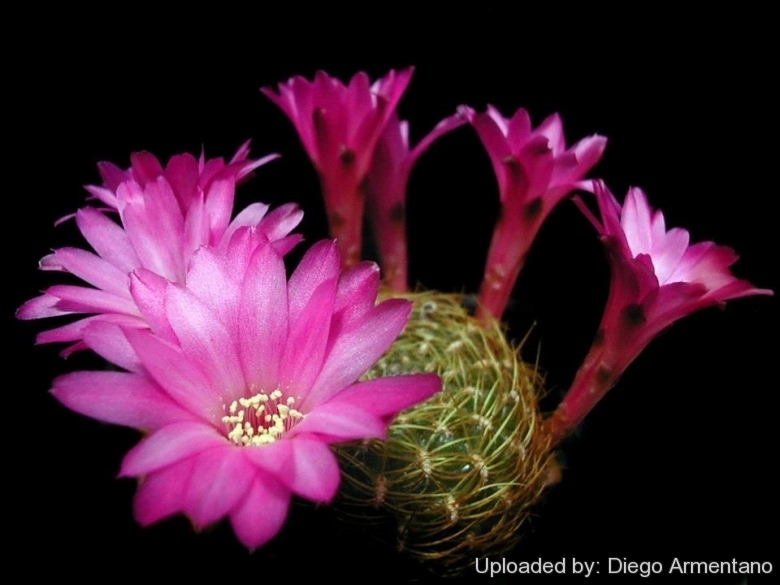 Plants of Rebutia mentosa may show different colours of spines, as well as flowers. Often plants with lighter spines tend to have a lighter skin colouration and sometimes lighter flowers too. Stem: Single, flat hemispherical 25 mm tall and 60 mm wide, in cultivation occasionally reaching 60-70 mm in width and forming a tuft. Epidermis bright green. Ribs up to 18, spiralling. Areole: Elongate about 8 mm long with a creamy white wool. Radial spines: About 24, up to 20 mm long, bent radially towards the apex, bright yellow. Central spines: 2-5, about 20 mm long, thicker than the radials, protruding at the top of the areoles, bright yellow. Flowers: 35 mm long, 40-50 mm wide. Perianth segments, often with a fine tip, dark to pale violet-red, with lighter medium strips, sometimes almost wholly white. Ovary and tube pink with darker scales. Throat, stamens, style and stigma white. Fruit: Sherical, 7-10 mm wide, reddish brown with lighter scales. Seed: About 1.2 mm long and 0.8 mm wide, testa matt black, hilum rounded, dark.